The outer facade of Ms. G's, lit by glowing red neon lights, exudes a sense of playfulness and mystery. It's enough to make you instantly want to enter and join in on the fun. The restaurant combines funky, pan-Asian food with contemporary Western culinary trends. There aren't many items on the menu that you will have come across before, but a lot that will engage your curiosity. Many of these are ideal for sharing, from mini katsu banh mi and cheeseburger spring rolls to sesame-style burrata and fried chicken with Tom Yum mayonnaise. The drinks menu is also very intriguing, with Asian-inspired cocktails that come in plastic, sealed cups just like bubble tea. The interior consists of a multi-story dining space, which is thoughtfully split over more than three levels to create a greater impression of spaciousness. Tables are spread over the different levels so that you feel like there are fewer diners in the restaurant than what it actually has capacity for. Each table is topped with a tin of chopsticks, cutlery and thick drinking straws. We start with a simple dish of kingfish sashimi, dressed in ponzu and sprinkled with the finest pieces of konbu and chive we've ever seen. The ageing of the ponzu, combined with the umami konbu, creates a funky, salty flavour that is reminiscent of Chinese fermented black beans. It really makes the fresh fish come alive. The freshest oysters come with a warming, vinegary wasabi dressing. 'Chiang Mai' pork-filled gyoza pack a big flavour punch. They're tasty, plump and ever so spicy, topped with both fresh and dried shallots. The soft, slippery specimens are bathed in a sweet, sour black vinegar and soy dressing that adds a sharp tang to each mouthful. This is not your typical tempura. Long batons of eggplant are covered in a golden, beer-batter like crust that is slightly heavier than that of traditional tempura. They're seasoned with lots of salt and vinegar, and the result is a dangerously moreish, silky vegetable finger food that has all the very best qualities of a salt and vinegar chip. The fact that it's eggplant makes you feel a little less guilty about fried food! Words cannot describe how insanely delicious these squid ink noodles are. The best way to describe them would be as a cross between squid ink seafood spaghetti and sambal noodles. 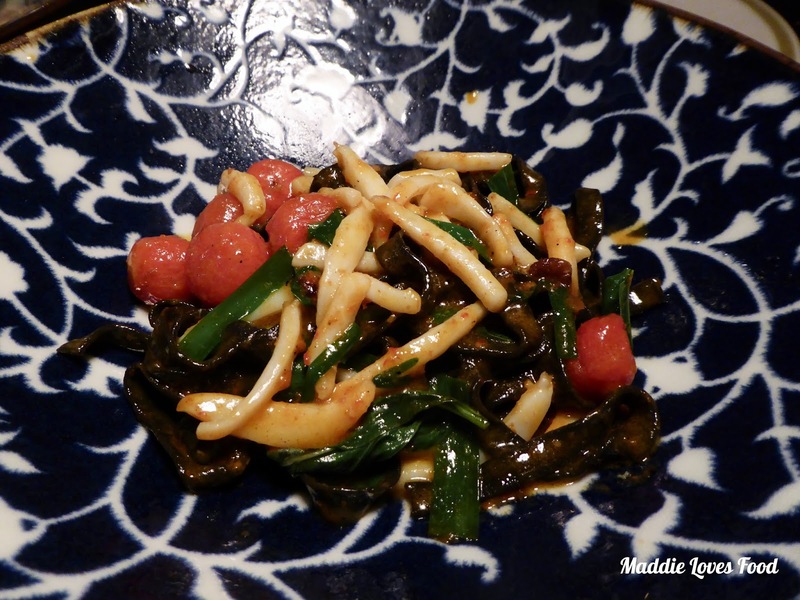 The homemade squid ink noodles comes in jet black, tagliatelle-style lengths, dispersed with short ribbons of tender calamari, sweet confit cherry tomatoes and spring onion. The whole lot is tossed in a hot, luscious, seafood-rich sambal butter, the colour of which gives the false impression of a tomato-based sauce. It's a phenomenal fusion noodle dish. This is no ordinary fried rice. This is cooked in the style of chicken rice, each grain slicked with the pungent, warming aroma of ginger that the classic Hainan dish is known for. It's a really good, smoky fried rice, flecked with flavoursome pieces of chicken, omelette and spring onion. The sunny side up egg tops it off nicely, allowing you to mix in the yolk to add an extra layer of silkiness. Wagyu skirt steak is imbued with fragrant, herby flavours of Vietnamese Pho. The meat, cooked to a medium rare, is so utterly tender that it just melts in the mouth. It's glazed in a shiny, concentrated sauce heavy with the signature spices of Pho. This dish really plays with your mind, because it has everything one loves about a pho noodle soup, only with a modern twist. The usual thin slices of beef are replaced with juicy, charred pieces of steak, and a concentrated sauce in place of the clear, medicinal soup. A salad of bean sprouts, coriander, onion and thai basil creates the perfect fresh accompaniment which further reinforces those quintessential Vietnamese flavours. Their take on pipis in XO sauce comes as plump clams tossed in a chunky XO sauce, alongside fried lengths of you tiao - those Chinese doughnuts often served with congee. The pungent sauce coats every crevice of the clam shells, and the dough sticks are perfectly hollow, crisp dipping vehicles. Ms. G's puts the fun into food, and manages to make out of the ordinary flavour combinations work together in so many different ways. It's Asian fusion food at it's best, and definitely one to try. I'm Maddie - a home cook and avid food lover roaming Sydney for all things edible and delicious. Welcome to my blog! Sign up for more deliciousness!